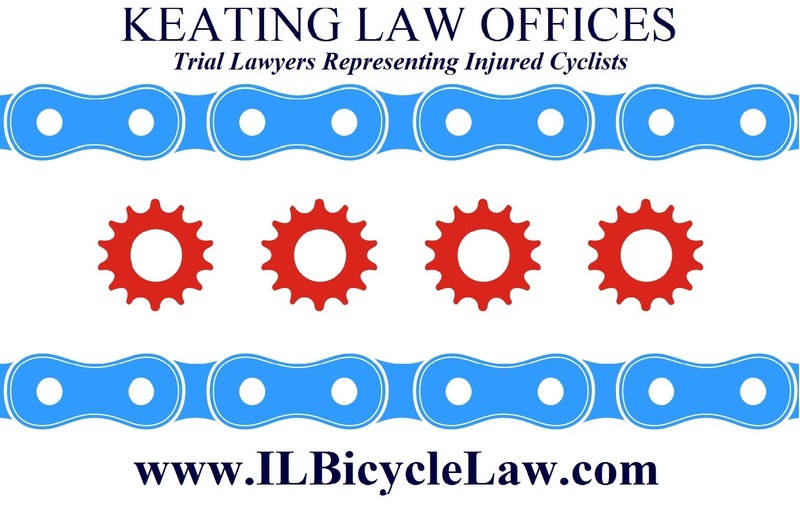 The Illinois Bicycle Lawyers at Keating Law Offices have been retained to represent a Chicago-area bicyclist who was injured in a motor vehicle vs. bicycle accident on March 22nd. The bicycle accident occurred when the driver was traveling northbound on Damen and approaching Fullerton. At the same time, the bicyclist was traveling southbound on Damen. When both the motorist and the bicyclist were at Fullerton, the driver made a "left hook," a quick turn in front of the bicyclist without yielding the right of way. A "plain language" reading of this statute makes clear that a motorist turning across traffic must yield to any oncoming bicycle. The statute plainly states that the turning vehicle must yield the "right-of-way to any vehicle approaching." 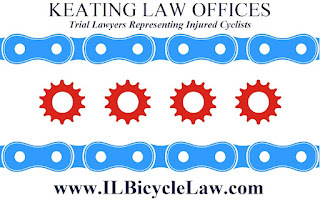 Since a bicycle is a vehicle under Illinois law there should be no argument as to what Illinois law requires. Justice should be blind, and it should not matter whether it was a bicycle or a motor vehicle that was the oncoming traffic. Bicyclists deserve, and the law requires, equal protection under the law.